Power Mode (PM) is a game mode that allows players to find eggs without having to click the “Hunt” crosshair. When you collect an egg in Power Mode a new egg automatically appears in another spot on the screen. You’ll collect eggs in batches of 100, at which point you’ll receive a report outlining the variety and rarity of eggs you’ve collected. You can continue to hunt in batches of 100 until the Power Mode is over. This fast-paced method of hunting means you can collect more eggs, quicker. Many players boost their scores and even have an easier time of finding Super Rares through Power Mode. How can I access Power Mode? Power Mode is activated by the number of Hatchlings players who are hunting at any given time. It works like this: every hour, on the hour, the Power Mode meter calculates a goal based on the number of players normally online at that time of day. The count of players online is live-updated. If it is higher than the calculated goal Power Mode will turn on. If not, Power Mode will remain inactive. Because the goal updates every hour, it may suddenly turn off or on at 8pm, 9pm or 10pm (etc.) sharp. 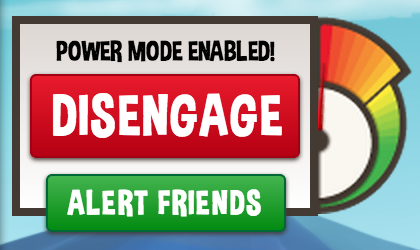 To see how close you are to activating Power Mode, keep an eye on this meter (located on the left-hand side of the game page). It will show you how many more players are needed to turn up the Hunt. By clicking “Rally Troops,” you can invite your friends to join you on Hatchlings to attempt to activate Power Mode. You can also Tip The Meter to boost the meter. The power meter looks like this and will show how many more hunters are needed to activate Power Mode. It says Power Mode is activated...now what? When Power Mode is activated, the meter on the left will indicate that you can begin playing—simply click the button on the meter to give it a whirl. How do I turn Power Mode off? When you're ready to get back to regular hunting, simply click the "Disengage" button on the meter to deactivate Power Mode. What happens when I finish a round of Power Mode? Your Power Mode Hunting Report will appear to give you a summary of your most recent Power Mode hunt. From there you can check your stats, and store or share your eggs.